Black Scab, EXT 5.4 liter. First Ford I have owned, but my dad had a '72 F150 that I learned to drive on...had a 3 speed on the column. So far only mods are had Ford nerf bars installed and put a Magnaflow muffler on (stock was just too quiet), going to be getting an Undercover cover soon. Had a '95 Nissan reg cab PU that I had for 12 years, big change!!! Never test drove any others, Tundra or Titan would have been only others. We would have bought a Screw if they had had one solid black ( don't care for the two tone) they tried to get us in a silver one,but wasn't going for it. Wife and I love this truck, about to go on a 2k+ mile trip soon (moving). First truck I've ever owned. White tu-tone with pueblo gold on the bottom. Already had the bed RhinoLined. I love this truck. Actually, this is my wife's truck. I took her to get a new SUV and she picked out this truck. I am so impressed with her tastes. Off road package, trailer/tow package, audiophile option....really nice. Yesterday, I go out to head to the local parts store and notice my back rear window was shattered!!!! Some punk kids shot rocks at the truck and busted the left window on the rear window. (It has the sliding rear window). Bummer! Last edited by KiLLeR_WoMBaT; 05-26-2007 at 06:04 PM. I bought Black FX2 Scab with 20s a week ago and put 500 miles since. I did the spray on liner this week and I have a Pioneer Avic-D3 in the mail. Those two mods are a must for me. I may not do anything else to it. I wanted to get the Screw but I was trying to be as price conscience as possible. I also wanted to be able to fit it in my garage and the Scab with 5.5 bed barely fits. I have about 1/4" clearance. Dislikes would be the seats. I've gotten use to them a little bit but I wish they came with better seats. They get uncomfortable about 20 minutes into the ride. BTW I had a 03 Black F150 Scab 4x4 a few years ago. I traded that in for a Charger RT...big mistake. 30K miles later and a failing transmission brought me back to Ford and the F150. I’ve been looking forward to adding my post to this list. SCREW XLT, 5.4L w/3.73 and a bunch of other options. Just picked it up this week. Took a couple of picks after a quick wash. I had a 97 GMC ¾ ton for years up until about a year ago. Then sold it after last summer to buy my wife a new minivan. So I’ve been driving an old 4 door Saturn for the past year. Man it’s good to be back among the living. Found this one at a dealership way out in the middle of the Nevada desert. He said it had a few aftermarket things on it but wasn’t specific. Got to the dealership after a 2 ½ hour drive, saw the truck and said “that’s the one.” I was waiting for the buyer’s remorse the day after the sale, but it never came. I love the ride. Feels tighter on the road than my GMC ever did. I’m still trying to find out what specific mods were done aftermarket. When I find out I’ll list them. From what I can gather here is what I know. I added a gallery if interested. i'm here. Love mine. starting to get better gas milage and more power. check my gallery. How many miles did that start to happen. My 11 mpg city is sucking!! Well, I guess I forgot to add myself to this list. Had the '07 for a couple months now. IT ROCKS. I had a '05 Supercrew FX4 and the '07 is a better truck. 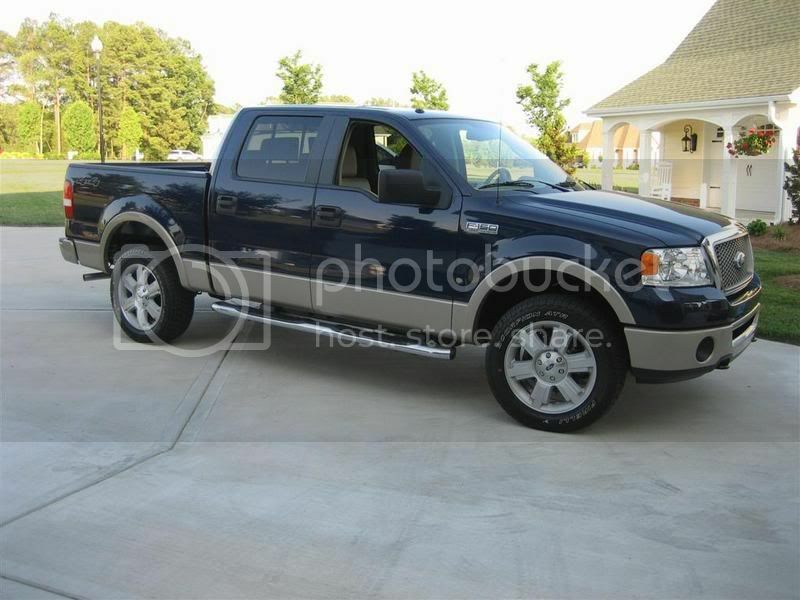 The 07 is a King Ranch Supercrew, 5.4L, w/ 3.73's. Forest Green Metallic over Pueblo Gold. well i got just shy of 10k miles on it now. not a great jump on the mpg's but i can tell. by the way adding xcal2 with tunes next week, also the 3.5 af1. hope that everyone has best of luck with their new rigs !!!! Just picked my new '07 up Monday afternoon. Went from an '02 regular cab long bed to the screw. I'm loving all the extra room in the back seat! Brand new to this forum and I guess I'm a 2007 owner out of desperation and disgust. Sorry for the long post, but I have to get it out. Bought a new 150 in 05. With 10000 miles on the truck, I left work and the brake pedal started fading to the floor. It would stop fine but almost at the floor. Stopped for gas started the truck all was ok and never did it again. At 17000 I was out of town and got a bad grinding noise in 2WD from left front when I left the hotel. Noise stopped after about 100 yards. The dealer had to replace a defective actuator and the half shaft. Shortly after I got it back I got a grinding noise from right front. Back to dealer. Another defective actuator right shaft was OK. All was waranteed so just an irritating inconvenience my large monthly payments were buying me I guess. All worked fine after that, but I always had the feeling that none of this should have happened and when and what will happen again. Today all my doubts about this truck came to a head. I backed my boat down the ramp and launched. The front wheels are on the concrete and the rears are on the gravel right behind the concrete. Then it happened. 4WD won't engage in hi or low, truck spins rears in the gravel and I'm stuck with 6 other people waiting to launch. Another guy unhitches his boat and pulls me up the incline. His well used old truck pulling my shiny decked out 23000 mile 05 was a pretty funny sight for the spectators. I pull the truck up to the parking area and shut it off to figure out what to do next. Decide I'll leave my buddy with the boat and drive to the dealership in town and see if they can figure it out quick. Wrong answer since it won't start now. My wife drives all the way out to the lake to get the boat and the tow truck comes to get the 150. Absolutely, positively the worst and most embarassing experience I've ever had with any vehicle and all my previous vehicles have been used. At this point I decided I would never trust anything but the tow hooks on this truck again. They could replace every part on the thing and I would always be concerned about "what's next and when". I got the best deal I could on an 07 with a lot more options and drove it off the lot. I've loved Ford trucks since I bought a 20 year old '62 stepside when I was a kid and some mid 70's 150s that were at least that old when I got them. I had to work on them here and there, but they cost under $1000 and I fully expected things to break. I know a lemon can come down the line of every brand, but the 05 was my first new vehicle and I thought spending 36k would keep me from crawling underneath it or looking under the hood unless I wanted to at least for a little while. Hoping for the best. Last edited by mcarus2; 06-10-2007 at 02:35 AM. Moral of this story: Should of bought used. Yup, and if this one ever leaves me stranded for any reason not caused by me under 50,000 you can bet that's what I'll do. Never a new anything with four wheels again. I'd rather my aggravation come with a lower price tag. Besides not parking a mile away from store entrances and washing every four years or so wasn't really that bad No recalls for exploding this or thats, no cares about the branches scraping against it on the way to the favorite fishing hole. I can afford em now, but only time will tell if I really want them. I have a 2007 XLT 5.4L Screw. 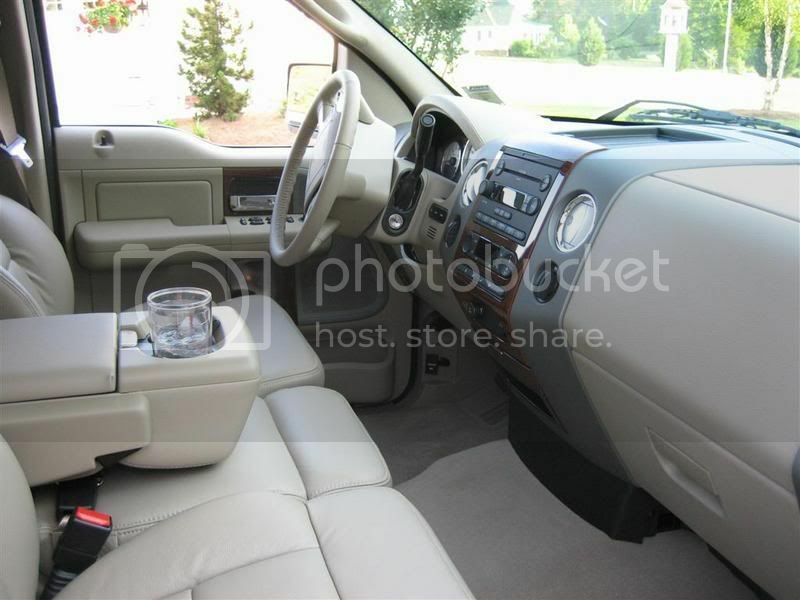 Mine, according to many others, seems to be fairly loaded for an XLT with the power pedals, power seat, power slider, and tow package. Just gave mine its first detail today and clay bar treatment. Then it rained. Oh well, I'll get pics of it after I get it polished and waxed next weekend. I have had mine for 4 days now, and have ZERO complaints. Rides like a dream, great gas mileage (compared to the 96 Dodge Ram Indy Edition I traded in, which only got 12mpg with 5.9 in it). I'm a newly converted Ford Fan thanks to my new F150. Next month, we are going to start shopping Expeditions to trade my wife's Trailblazer in on.